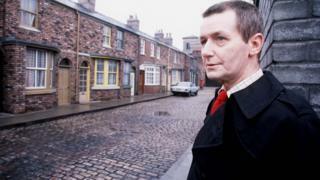 A script for Coronation Street creator Tony Warren's previously unknown first attempt at a soap opera has been found. Before Warren changed the TV landscape with Coronation Street in 1960, he started writing Seven, Bessie Street. His friend David Tucker said it centres on a terraced street but is otherwise very different from Coronation Street. The script was found in his possessions after he died in 2016 and is now part of an exhibition dedicated to Warren at Salford Museum and Art Gallery. Warren left his estate to Mr Tucker, a friend of 22 years, with an instruction to destroy all creative works that weren't already in the public domain. Image caption Seven, Bessie Street was billed as "a new soap opera in half-hourly episodes"
But Mr Tucker decided to keep the Seven, Bessie Street - with the proviso that no one else could read it. The script is in a frame in the Salford exhibition with just the cover page, billing it as "a new soap opera in half-hourly episodes", on show. Mr Tucker has read it, however, and says it was "quite obviously planned as a soap opera". "The only thing really that relates to Coronation Street is the setting of a terraced street and the fact that it jumps a little bit between peoples' lives," he told BBC News. "But there are no characters that relate to Coronation Street at all, and no scenarios. It's very different." Seven, Bessie Street revolves around a family - perhaps inspired by Warren's own - who all have theatrical connections. "That's what Tony did know about in his youth," Mr Tucker said. "That's probably why it would never have worked as it was, because there was so much in the stories about theatre. "He was writing from what he knew in that Bessie Street script, but it probably wasn't going to relate that well to everybody else. "So he then shifted the focus to the more mundane aspects of terraced street life." Although Warren cast the script aside, Bessie Street did make its way into Coronation Street. Weatherfield's local primary school is called Bessie Street School. The exhibition also includes the typewriter Warren used in his early years. After jettisoning Seven, Bessie Street, Warren pitched a drama titled Our Street to the BBC. But he didn't hear back, so he reworked it as Florizel Street for Granada. Florizel Street was changed to Coronation Street because - as legend has it - a tea lady named Agnes remarked that Florizel sounded like the name of a disinfectant. Coronation Street launched in December 1960 and soon became one of the most popular programmes on television. The exhibition also traces Warren's early life and career, which included acting in the BBC's Northern Children's Hour and writing for police series Shadow Squad. According to a 1958 receipt, he was paid £150 for the latter. The exhibition also shows his past as a male model, appearing on the cover of a 1957 edition of Knitters Digest and on the packet for a pullover knitting pattern. There are many mementos from the Corrie years too, including his MBE, various awards, his red This Is Your Life book and letters from former poet laureate John Betjeman describing it as his "favourite programme". Betjeman and Laurence Olivier were such fans that they were chairman and president respectively of the British League for Hilda Ogden, established in 1979. Tony Warren's Coronation Street runs at Salford Museum & Art Gallery until 3 July.